In this article, we talked about the list of documents required for GST Registration in India. 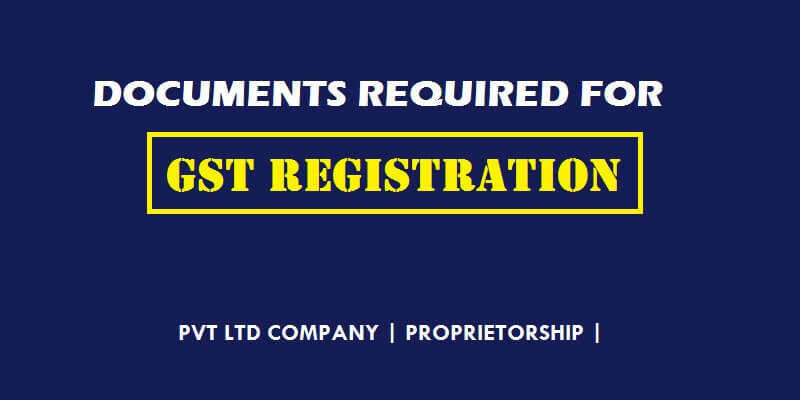 We know that, GST Registration requires a few documents to be submitted along with the GST application (REG-01). Submission or attachment of required documents is compulsory for successful processing of GST application. Non-submission of required documents may result in rejection or delay in processing of the GST Registration. AOA (Article of Association) Copy. Principal Place of Business is the primary location within the State where a taxpayer’s business is performed where the business’s books of accounts and records are kept. Other documents like Board Resolution, Authorisation letter etc., will be prepared by us. below are the list of documents needed for Principal place of business. Process to apply for GST Registration in India is completely online. You do not need to visit government office or any authorities office to apply it. Process is very simple, quick and hassle free. You just need to book our service online. Email or Whats App the required documents (scan copy). We will prepare and submit your GST application form. We will make ensure that your GST Application form submitted along with all the required supporting documents. You will get your GSTIN in 3-5 working days. Our Expert Team will guide from the scratch. They will explain you everything about GST and its process for enrollment. We are also providing GST Return Filing and GST Compliance services. You have comply with GST laws , once you get your GSTIN Number. Like you have to file your monthly GST Return on or before due date.